Sir David Attenborough will present the sequel to 2001's The Blue Planet, the BBC has announced. The seven-part series, to be shown later this year, will aim to highlight recent scientific discoveries. Filming innovations include suction cameras fitted to the backs of orcas. "I am truly thrilled to be joining this new exploration of the underwater worlds which cover most of our planet, yet are still its least known," Sir David said. 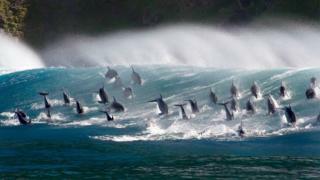 The BBC's Natural History Unit spent four years filming off every continent and in every ocean for Blue Planet II, with support from marine scientists. James Honeyborne, the series' executive producer, said: "The oceans are the most exciting place to be right now, because new scientific discoveries have given us a new perspective of life beneath the waves. "Blue Planet II is taking its cue from these breakthroughs, unveiling unbelievable new places, extraordinary new behaviours and remarkable new creatures. Showing a contemporary portrait of marine life, it will provide a timely reminder that this is a critical moment for the health of the world's oceans." Among the recent discoveries caught on camera are a tuskfish that uses tools and a new species of crab with a hairy chest - nicknamed the "Hoff crab" after Baywatch star David Hasselhoff. The Natural History Unit's new filming techniques include "tow cams" that can capture predatory fish and dolphins head-on, suction cams which attach to the back of whale sharks and orcas for a creature's-eye view, and a probe camera that can record miniature marine life. The BBC said the crew caught unusual examples of marine behaviour on camera, such as a coral grouper and reef octopus with sophisticated hunting techniques, a giant trevally fish that catches birds in flight, and a dive with a sperm whale mother and her calf. It said the series would also explore new landscapes from methane volcanoes erupting in the Gulf of Mexico to the Antarctic deep at 1,000m, filmed using manned submersibles. The Blue Planet was watched by more than 12 million people in 2001 and won Baftas and Emmy awards for both cinematography and music. The sequel will be broadcast on BBC One later this year.